Some of this information is traditional "benchmarking", ie. comparing budget size, % profit (or similar) ratios, and employee participation. Yet, the bulk of LBG Canada analytics focuses upon the "how" of community investment, employee volunteering and giving, ie. strategic choices, resourcing decisions and management practices that contribute to overall program success. We are energized by the feedback from companies using this information to inform and support their work. The data set has been growing for 12 years, and is very often enriched by the good ideas and innovations offered by participating companies. This mini survey is one such example. In responding to a request for data analysis about how companies acknowledge executive interest in community, we seized the opportunity to go further & deeper. 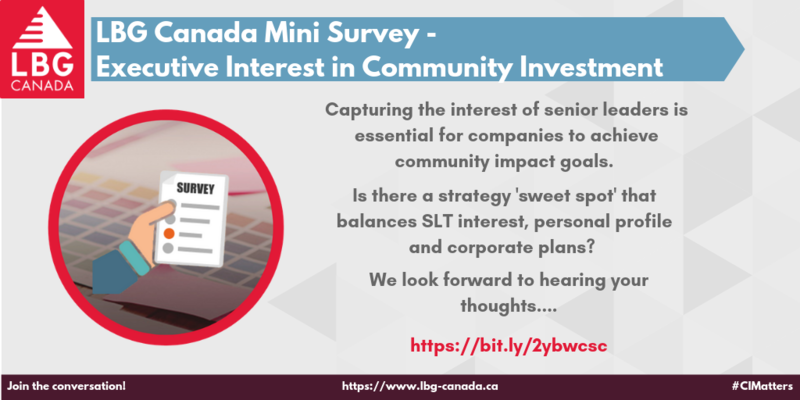 We look forward to analyzing and sharing your responses to the five key questions within, and to incorporating them in the LBG Canada program on an on-going basis. Thank you for your participation. As ever, all company responses remain confidential. Please let us know how you have put the results to good use!